Anyone ever buy a Jersey from here? I bought one 15 years ago from here and it was an interesting affair....I wanted a Bergeron jersey and NHL.com was out so I figured I'd give River City Sports another try because they had one in stock. The jersey tracks repeatedly to West Palm Beach Florida. I figured they would have improved their customer experience but that doesn't seem to be the case. If I don't receive it by the end of the week I will start requesting a refund and keep this updated. Well its officially been 1 month since I ordered this in stock item from RCS. While the fellow at RCS seems pleasant enough he does not appear very concerned with a prompt solution. Perhaps with Winnipeg winning their first playoff game we can get back to business! It does appear that it has been returned from West Palm Beach to Winnipeg and the label fixed (per an email I received from Canadapost) even though I was told the label was accurate the first time. This is a well traveled Bergeron Jersey! There are so many damned fake jersey sites out there. I was looking for a Whalers jersey (foul) for my wife. Can't find a legit one anywhere to foul up. River City Sports used to be pretty legit. 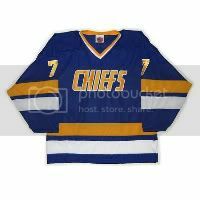 They've been in business a long time and I have previously ordered CCM jerseys here. This lack of concern/urgency for customer follow up is a bit disturbing....I know Winnipeg is in the playoffs but just need to drop it back in the mail and send me a tracking number. Lack of customer communication is the reason I stopped ordering from here 15 years ago. I should have known better, but, this was an instock item so I thought it would be pretty straightforward. NHL.com has sales all the time and even though they are slow.....there is constant communication. I am attempting to be good natured about it. Hopefully it arrives before the draft. Hey....look what showed up yesterday......4/23. 6 weeks later but at least it showed up. 1st round priorities up in Peg!